Shri. 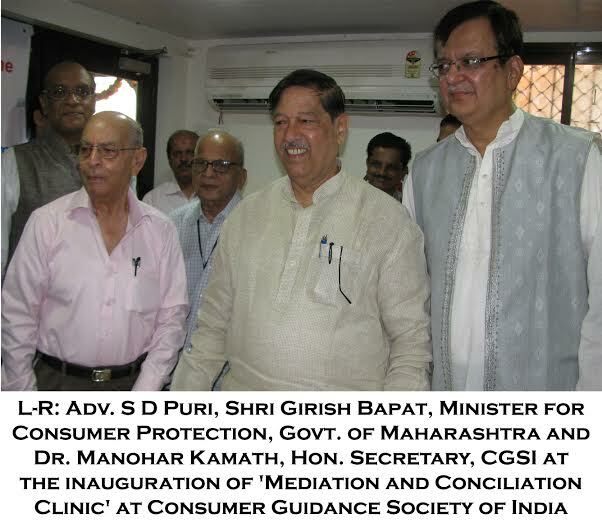 Girish Bapat, Cabinet Minister for Consumer Protection, Government of Maharashtra, launched the Mediation and Conciliation Clinic of Consumer Guidance Society of India (CGSI) yesterday, October 20, 2015. The idea of speedy justice for consumers has now assumed realistic proportions thanks to the inauguration of the ‘Mediation and Conciliation Clinic’ by CGSI (Consumer Guidance Society of India). Arun Deshpande, Chairman, Consumer Welfare Advisory Committee of Maharashtra was also present during the inauguration. The clinic primarily aims to resolve cases pertaining to consumer disputes. Dr. Kamath, Hon. Secretary, CGSI, opined, “This clinic will help the consumers to solve their problems out of court without facing the problem of litigation. Even today cases going back to 1997 are still pending and hence mediation and conciliation will help in reducing court cases and expedite justice for the common man”. Rajesh Kothari, Solicitor and Advocate, stated “Following the normal process of court is very tedious, time-consuming and expensive. Here at CGSI, we are providing an alternate mode of dispute redressal. We will call both the parties and use our platform as an NGO and try to resolve the dispute”. 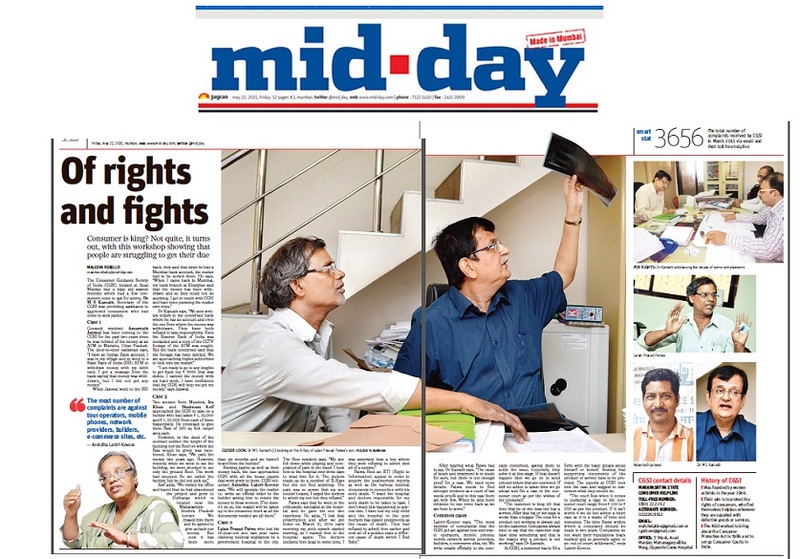 Mid Day visited our CGSI office and wrote about our activities. The Consumer Guidance Society of India (CGSI) located at Azad Maidan had a legal aid session recently which had a few consumers come to ask for advice. Dr M S Kamath, Secretary of the CGSI was providing assistance to aggrieved consumers who had come to seek justice. Many Citizens find that when they make applications for certain services or for some corrections or make a complaint or representation to Government bodies they get no response. Now there is a very powerful law in Maharashtra which can empower us. If citizens use it with RTI it can result in better governance and delivery of timely services. Its name is a mouthful: ‘Government Servants Regulation of Transfers and Prevention of Delay in Discharge of Official Duties Act (Act 21 of 2006)’. The first part –Chapter 2- specifies that government servants must have a tenure of three years and should normally be transferred only in April or May. If this is violated reasons must be given. Citizens can use this to curb arbitrary transfers of good officers like Khemka or Pardeshi. The second part, Rule 10 effectively says that no decision on any file can take more than 45 days if a matter has to be decided within the department, and no more than 90 days where other departments have to be consulted. Rule 10 (3) [ 64C for BMC] alongwith the rules requires the competent authority to do a preliminary investigation within 15 working days and take disciplinary action if negligence is established. In short if an application/complaint/representation has received no response for over 90 days, if the citizen brings it to the notice of the competent authority (Secretary of the department), the Secretary is obliged to take steps to fix responsibility for dereliction of duty. “ I had given my application for……….. on ………….. Since then I have received no communication. I would like to draw your attention to Section 10 of the Transfers and Delays Act 21 of 2006/ ( 64C of the Mumbai Municipal Corporation Act) which mandates that no decision can be kept pending for over 3 months. In the instant case, no decision has been communicated to me despite the lapse of…… months. I request to conduct a preliminary enquiry to fix responsibility on the officers responsible for this delay and take appropriate disciplinary action against them. I request that the report of the enquiry may please be sent to me.